A Hyundai i30 N competing in the Nuerburgring 24-hour race in May. SEOUL – Hyundai will start production of its first N-badged model, the i30 N, in September at its Czech Republic factory. The i30 N, a performance version of the brand's i30 compact hatchback, will debut at the Frankfurt auto show on Sept. 12, powered by a heavily modified version of the 2.0-liter turbocharged engine used in the Sonata sedan. The i30 N will have two horsepower outputs. Hyundai has not yet specified the car’s technical specifications but reports in the specialist auto press said the i30 N’s power outputs could be between 260 hp and 280 hp. "You can expect a very competitive, fun drive for your money," said Albert Biermann, former chief engineer of BMW’s M tuning division, who was hired by Hyundai in 2014 to head its new performance unit. Hyundai is developing N-badged cars to further distance itself from its roots as an affordable brand. The i30 N will compete with models such as the Volkswagen GTI, Ford Focus RS and sporty versions of the Renault Megane and Seat Leon. Biermann has said technology from the N-badged cars will be incorporated into other Hyundai vehicles, enhancing the performance of the entire lineup. Sales of the i30 N will start in Europe shortly after the Frankfurt show. The i30 N will also be sold in Australia, but not in the U.S. or China. The U.S. and China will get different N-badged cars “in the same spirit” as the i30 N, said Min Soo Kim, head of N brand strategy. Hyundai has been polishing its sporty credentials since it decided to enter the World Rally Championship in 2013 and first revealed its plans for a N-badged line at the 2015 Frankfurt auto show. 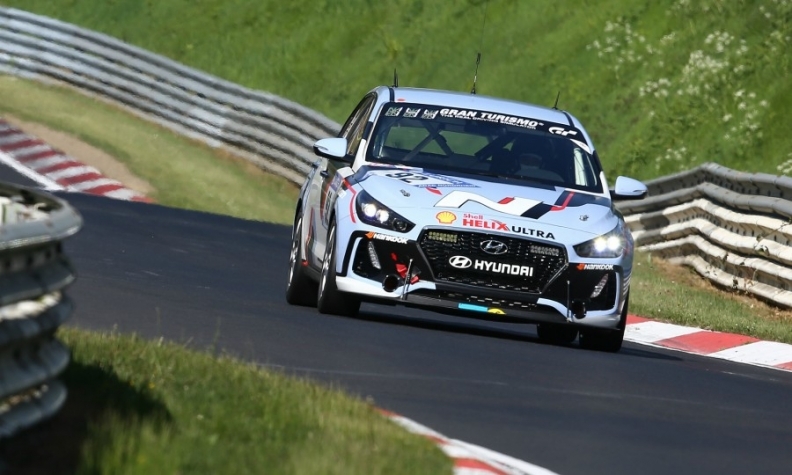 The “N” letter comes from Namyang, Hyundai’s r&d Center in Korea, and also from Nuerburgring, the German race circuit that is home to Hyundai’s European test center. Two close-to-series-production i30 N models finished the ADAC Zurich 24-hour race at the Nuerburgring in May, completing 244 laps on the track, which equals more than 6,000 km. The i30 N will be a track car suitable for everyday use, Biermann said. Affordability was a key target during the development of the car. “We haven’t spent money on fancy lightweight components that could have pushed the price too high” he said. Hyundai has not disclosed any pricing details for the car. Biermann said the i30 N will be sold ready to be taken onto race tracks although tuning packs might be available in some markets. No decision has been make on whether to offer a four-wheel-drive version or a dual-clutch transmission. A hybrid version "is just a matter of time," Biermann said, although there’s no plan. If Hyundai needed to build a hybrid version to reduce emissions to meet regulatory requirements, for example, "we would be ready," he said. Hyundai plans to launch two more N-badged models, one next year and another in early 2019. It hasn’t shared details on the models but motoring press reports have said Hyundai plans to introduce an i20 N subcompact and a Veloster N coupe. Biermann said he would love to see a N version of Hyundai's upcoming Kona subcompact SUV because small crossovers are becoming increasingly popular but said the N division’s resources were limited. The N division employs 120 people in Namyang and 15 in Ruesselsheim, Germany, with additional help coming from engineers in Hyundai’s powertrain and chassis departments. Correction: The Hyundai i30 N will be sold in Europe and Australia. A previous version of the story mistakenly included a third market.